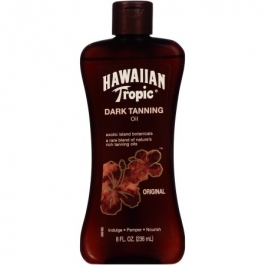 A warm sun, island breezes, luxuriant oils and a heavenly scent - Hawaiian Tropic® Dark Tanning Oil is infused with Island botanicals that soothe and pamper, while time-released antioxidants provide skin nourishment. Indulge in the sun, and keep your skin soft and radiant! No sunscreens. To be used by those with a good tan. This product does not contain a sunscreen and does not protect against sunburn. Repeated exposure of unprotected skin while tanning may increase the risk of skin again, skin cancer, and other harmful effects to the skin eve if you do not burn. For external use only. If irritation develops, discontinue use. Avoid contact with the eyes. Keep out of the reach of children. ©2009 Tanning Research Laboratories, Inc. Apply generously and evenly to exposed skin. Reapply often.